Where corneal central radius of curvature, corneal eccentricity and even diameter have proven to be poor indicators of overall sagittal height of the eye, another indicator may prove to be a better predictor: the peripheral corneal angle. In this last part of the trilogy on soft lens fitting and ocular surface shape, a calculator is introduced that, in a step-by-step manner, can help better predict overall sagittal height and can therefore be used in soft lens fitting. The sagittal height of the cornea over a chord of 10.0 mm as measured by corneal topography, i.e: 1,750 microns. 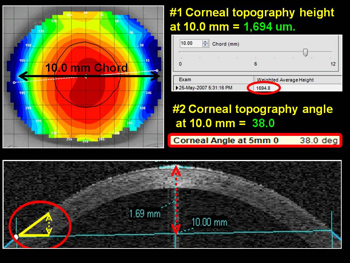 The corneal angle that forms at the 10.0 mm chord as measured by corneal topography, i.e., 36.0 degrees (Figure 2). A scleral angle compensation factor. The desired chord diameter to be calculated. The calculator then estimates the sagittal depth at the given chord (Figure 3). 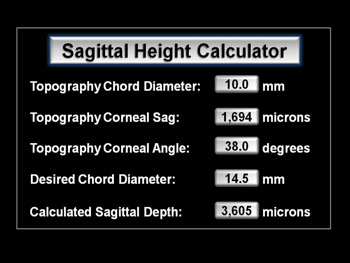 The calculated sag (3,605 microns) can now be used to determine the optimal sagittal height for a custom soft lens. Studies by Pacific University and Alden Optical have found that a soft contact lens with a sagittal height approximately 200 microns higher than the sagittal height of the eye usually provides the most optimal fitting relationship. Table 1 shows the theoretical sagittal heights of different base curve radii soft lenses with a 14.5 mm diameter. (Charley Creighton 2012). By referring to the above lens sag chart, it is possible to match the sagittal height of the eye (3,805 µm) with the sagittal height of the contact lens. In the example above, a contact lens with the variables below matches almost perfectly with the calculated corneal/scleral sagittal height. This would be the first trial lens at least, to be used on the eye. To better serve our soft lens-wearing patients in the future, more information about the anterior ocular surface shape is needed. 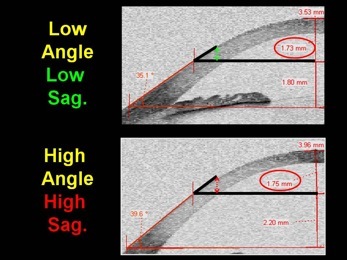 Total sagittal height may prove to be one of the factors that is crucial in this process and that can hopefully give us better tools in our contact lens practices to optimize soft lens fitting. Professor Caroline serves as an instructor and lecturer at the Pacific University College of Optometry in Forest Grove Oregon (USA). He is a Fellow member and Diplomat of the Cornea and Contact Lens Section of the American Academy of Optometry. 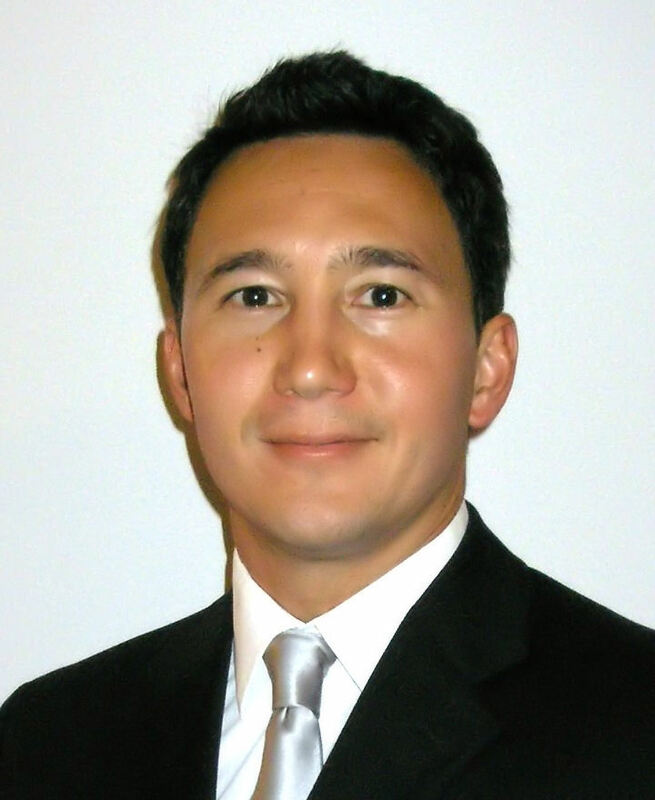 Patrick is a Council member of the International Society for Contact Lens Research as well as a member of the International Association of Contact Lens Educators and the American Association of Optometric Educators. For the past fifteen years Patrick has served as a contributing editor for the Contact Lens Spectrum and is on the editorial board for Contact Lens and Anterior Eye Journal. He has published over 300 papers on a wide range of contact lens topics and has lectured extensively throughout the world. Randy Kojima is a research scientist and clinical instructor at the Pacific University College of Optometry in Forest Grove Oregon (USA). He is also the Director of Technical Affairs for Precision Technology in Vancouver, Canada and a Clinical Consultant to Medmont Pty in Melbourne, Australia. Society and the International Orthokeratology Society.